The third edition of this popular and effective textbook provides in one volume a unified treatment of topics essential for first year university students studying for degrees in mathematics. Students of computer science, physics and statistics will also find this book a helpful guide to all the basic mathematics they require. It clearly and comprehensively covers much of the material that other textbooks tend to assume, assisting students in the transition to university-level mathematics. Expertly revised and updated, the chapters cover topics such as number systems, set and functions, differential calculus, matrices and integral calculus. Worked examples are provided and chapters conclude with exercises to which answers are given. For students seeking further challenges, problems intersperse the text, for which complete solutions are provided. Modifications in this third edition include a more informal approach to sequence limits and an increase in the number of worked examples, exercises and problems. 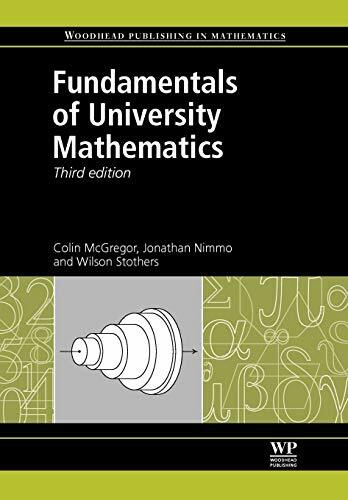 The third edition of Fundamentals of university mathematics is an essential reference for first year university students in mathematics and related disciplines. It will also be of interest to professionals seeking a useful guide to mathematics at this level and capable pre-university students. Colin McGregor is an Honorary Research Fellow in the Department of Mathematics, University of Glasgow, UK.